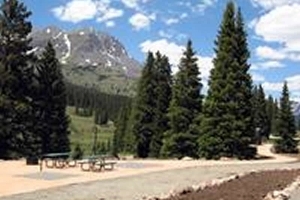 Molas Lake Campground has more than 50 campsites serving tent-campers, small RV's and pop-ups, and a few sites over 1,500 square feet to serve even the largest RV's. The park has one water pump, several clean and new vault-style restrooms, and showers ($5 per use). There is no longer a dump-station for RV's but dump-stations are available 10 minutes away within the Town of Silverton for a small fee, typically around $10. The campground and day-use amenities were completely renovated in 2008. Swimming is not permitted in Molas Lake. 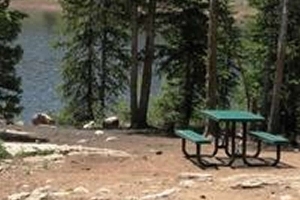 The campground is open from approximately June 1 to September 30 each year, weather permitting. There is limited cell service and no internet connectivity at the campground. 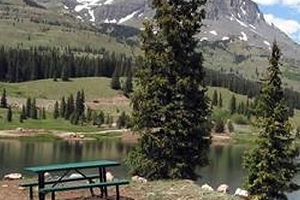 Molas Lake Campground was granted to the Town of Silverton in 1925 from the U.S. Bureau of Land Management. 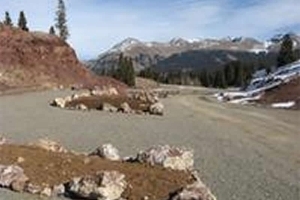 The 137-acre campground sits 10 minutes from Silverton along the Million Dollar Highway (US 550) in the central San Juan Mountains; the most spectacular peaks in the Colorado Rockies. 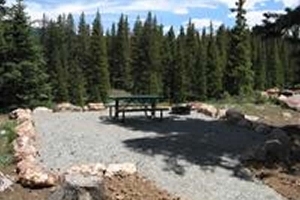 The Campground is adjacent to the largest wilderness area in the state of Colorado, the Weminuche Wilderness, is surrounded by the San Juan National Forest, and is accessible to the Colorado Trail. This extra-large site is suitable for campers in an RV of up to 23 feet in length, tent campers, or pop-up campers. It includes a concrete surface with level, paved access to a clean vault-style toilet. NOTE: Before 2019 these sites had different site numbers! Please see the Campground Map and cross-reference at the end of the Individual Site Description document. This site (Site# URV1) is a smaller version of our Lake View RV sites. This one site sits on an isolated bluff above Molas Lake and can accommodate a pop‐up camper or small RV less than 20 feet. 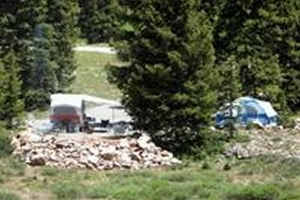 There are 29 individual SMALL RV/TENT campsites. Each site has a gravel parking and tent pad or all‐dirt surface, as well as a fire pit with a cooking grill and picnic table. These are ideal sites (Site# W1-W5) for tent campers who don't mind a 50‐ to 200‐foot walk from their shared parking area. These sites are best for campers who pack light and don't mind being away from their car. Note: There is no dump station at Molas Lake Campground, however dump stations are available in the Town of Silverton for a small fee. * Pets are welcome. All dogs must be on-leash at all times when in the park and never left unattended. Owners are responsible for picking up after their pets to ensure a clean campground, campsite and surrounding trails. This policy is strictly enforced. * Day-Use Areas: Our four day-use areas are available free of charge, on a first-come first-serve basis. Each area has a BBQ grill and picnic table. Day-use hours are “Dawn-to-Dusk”. * No swimming is allowed in Molas Lake. * Fishing: Colorado Fishing Licenses can be purchased at Outdoor World in Silverton (1234 Greene St), which is about a 15 minute drive from the park. Alternatively, you can purchase a Colorado fishing license from the Colorado Parks and Wildlife or other outdoor store. Check the CPW Web Site for current license fees. You'll need to supply your own fishing equipment. Rainbow and brown trout are the most common species in the lake. Cleaning of fish is only allowed at the fish cleaning station and all unwanted fish byproduct must be bagged and discarded in the dumpster. Limit of fish is 4 per person. * The campground is open from June 1 to September 30 each year, weather permitting. * Pets are welcome. All dogs must be on-leash at all times when in the park and never left unattended. Owners are responsible for picking up their pets to ensure a clean campground, campsite and surrounding trails. This policy is strictly enforced. * Check-In begins at 1:00 PM. Check-Out: 11:00 AM. Any arrival after our store/office closes at 7:00 PM, a map with your name on it will be placed on the office door with directions to your campsite. Please call us if you cannot make it before 7:00 PM at (970) 387-4022. All campsites must be vacated by 11:00 AM on check-out day. * Minimum Check In Age is 18 Years Old. Guests aged 17 Years Old and under at the time of check in are considered children. At least one adult (person at least 18 years old) must be in your party and present at check-in. * Maximum number of guests per campsite is 8 (if you have more, reserve more than one site). * Maximum number of tents per campsite is 2 (if you have more, reserve more than one site). * Maximum number of vehicles per campsite is 2 (if you have more, reserve more than one site). RVs, pop-up trailers, or any other wheeled trailer are counted as one vehicle. Any questions please e-mail us at info@molaslake.com or call (970) 387-4022. * For groups of 15 or more, please Email Us or call 970-387-4022 for group site information. * All reservations and drive-in campers MUST STOP at the OFFICE before entering the campground and check-in with the Camp Host. * New for 2017 season - your reservation is by Camp Site #. If your stay is longer than a certain site is available, we encourage you to make multiple reservations and switch sites. * The Campground has limited cell service, no internet connectivity, no electricity and no RV hook-ups, or dump station. * Firewood is available for sale from the Camp Host. Due to ecological concerns and the appearance of invasive species, campers are strictly prohibited from bringing firewood from out-of-state. * Hot water shower facilities are available for $5.00 per token. Showers are open from 7:00 AM - 10:00 PM. * Generators must be reasonably quiet and are ONLY ALLOWED in the Standard RV (Rock Cliff Area) Sites and Lake-View Ultra RV and Lake-View Small RV Sites from 8am to 8pm. Generators are not allowed in the general campground at any time. * Our online reservation system allows campers to reserve a campsite in their chosen site TYPE (category) and to select an individual campsite by site #. * Reservations are highly recommended, but not required. If you arrive without a reservation, the campground management will make every effort to place you at a site, subject to availability and existing reservations. Note, we normally sell out from mid-June to late August - book early. Our online reservation system opens on January 1st, with most summer reservations being booked prior to the campground opening. * During the July 4th and Labor Day Holiday periods, prices are increased by 50%. If you have not made a reservation, please save yourself a trip: Molas Lake Campground is guaranteed to be at capacity during these times. Click HERE (Lodging>Camping/RV) for more information about camping during July 4th. Click HERE (Lodging) to contact other lodging and camping options during July 4th and Labor Day holiday periods within the Town of Silverton. * Credit Card charges will appear as Molas Lake Campground on your statement. * To cancel or change your reservation, please either Email Us or call the campground at 970-946-6570 and specify that you booked your reservation online. * Cancellations made within four days of your arrival will incur a charge equal to 50% of your total reservation fee, plus tax. No refunds will be given for cancellations made within 3 days of your arrival.